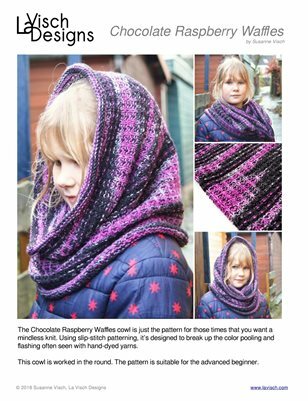 The Chocolate Raspberry Waffles cowl is just the pattern for those times that you want a mindless knit. Using slip-stitch patterning, it’s designed to break up the color pooling and flashing often seen with hand-dyed yarns. This cowl is worked in the round. The pattern is suitable for the advanced beginner.